Cooking ahead of time is really important if you’re trying to eat healthy while leading a busy life. I first wrote a post on how to cook dried beans, which are a super smart choice for both health and financial reasons. Beans are really good for you, but if you’re really trying to improve your health, fiber is your BFF. That’s where cooking whole grains comes in. Cooking whole grains is super easy, but not a week goes by where I don’t get an email from a frustrated home cook who runs into problems while cooking them. Maybe their whole grains are crunchy and hard, or worse, they end up super mushy. Ugh. 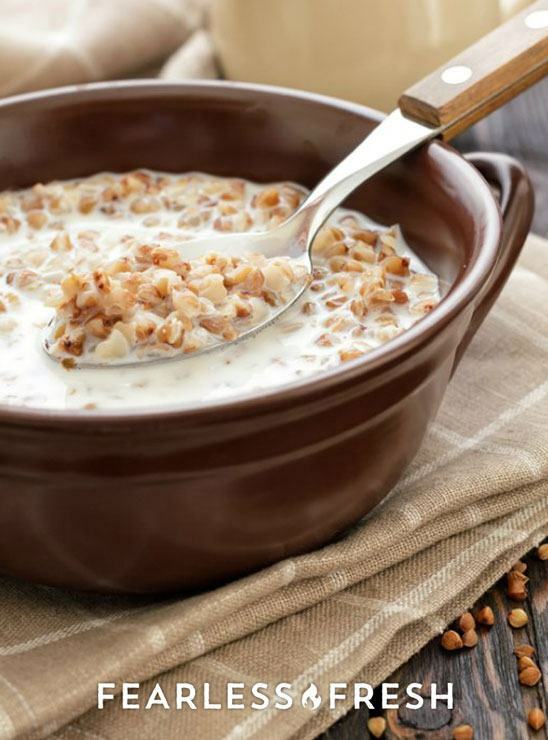 Why bother cooking whole grains? Whole grains are super-important to your everyday health, since they keep your blood sugar humming along at a happy level and contain enough fiber to prevent your digestive system from getting all wonky. White rice can seem like the perfect quick home cooked meal if you’re in a hurry, but before you grab one of those “boil in bag” things, think about what those whitewashed grains are doing to your body. It’s not good. White rice is basically a Snickers bar in disguise. Don’t believe me? Check out the details on what white rice does to your blood sugar levels, and how it can cause you to overeat. Eating refined grains, such as white rice, is a cheap way to eat, but they can contribute to a series of health problems such as obesity, insulin resistance, diabetes, polycystic ovarian syndrome and a host of other unsavory conditions. While eating white rice is healthier than chowing down a Snickers, it’s not that much healthier. What’s the point of watching the amount of carbs you eat when the carbs you’re scarfing don’t have any nutritional value? Given all of that, whole grains are the best choice for your dinner table. 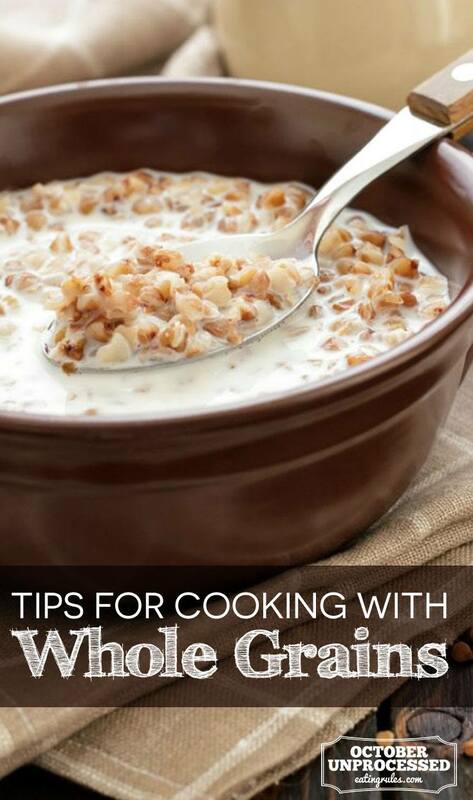 And I promise — cooking whole grains is super easy. It’s true that whole grains take longer to cook than white grains and when you’re busy, you probably don’t want to wait an hour and a half for dinner. Thankfully, modern electronic science has bestowed upon us the ultimate in kitchen convenience: the rice cooker. It’s seriously the ultimate tool, whether you’re a serious kitchen ninja or just learning how to cook. Cook ahead for maximum convenience. Did you know that you can cook any whole grain in a rice cooker? With a rice cooker you can literally flip the thing on and walk away. Or, do what I do: Make them on the weekend so you have easy, healthy food ready to go every night of the week. On Sunday night I cook four cups of brown rice, either in a pot or in the rice cooker, and once it’s done I fill up Tupperware containers and store them in the fridge. Now I’ve got brown rice to last me all week and I can literally eat healthy on a moment’s notice. Toss it into stir-fries, casseroles or just plain eat it on the side. Here’s another smart option for improving your whole grain efficiency — are you aware that brown rice and other whole grains freeze beautifully? If you want to make up a ridiculously huge amount to store for future dinners, add 10% less water when you cook the grains to keep it a little firmer. Once the grains are done and still warm, line a cookie sheet with a piece of parchment and spread the grains out in a thin layer on a cookie sheet to cool. Set the cookie sheet in the freezer for a few hours. Once the grains are frozen, scoop them into a zip-top bags and store in the freezer for up to six months. Voilà! Future You will adore how much Past You took care of business. IMPORTANT: Don’t forget the salt! If you want your whole grains to turn out tasting delicious and satisfying, then there’s one thing you don’t want to forget: SALT. Just like cooking perfect pasta, you need to salt your cooking water before adding your whole grains. How much salt do you need to use? The water should be noticeably salty when you taste it, slightly less salty than seawater. This is an all-important step. If you forget to salt your cooking water before adding your whole grains, no amount of salt added after-the-fact will make them taste sufficiently salty. Prepare 4 cups of brown rice or other whole grains this week, portion it into 2-cup containers, and freeze it. Then defrost whenever you need a quick, healthy starch for dinner. If you run into any problems, hop into the Fearless Fresh Ninja Group on Facebook and explain what’s going on. We’ll get it sorted out. The whole reason I created this group is so that you can get your cooking questions answered and be a part of a vibrant cooking community. It’s the place to ask cooking questions, share recipes, and to hear how others manage their crazy experiences in the kitchen. I’m a cooking teacher by trade. When I talked to my cooking students about what the kind of help they wished they had in the kitchen, almost every single person said, “I wish I had you right here every day to answer my questions!” Since I’m not a miracle of physics and have not yet mastered cloning (I’m working on it…) I developed the next best thing: My most valuable step-by-step cooking advice formatted in colorful, easy-to-read charts and tables. 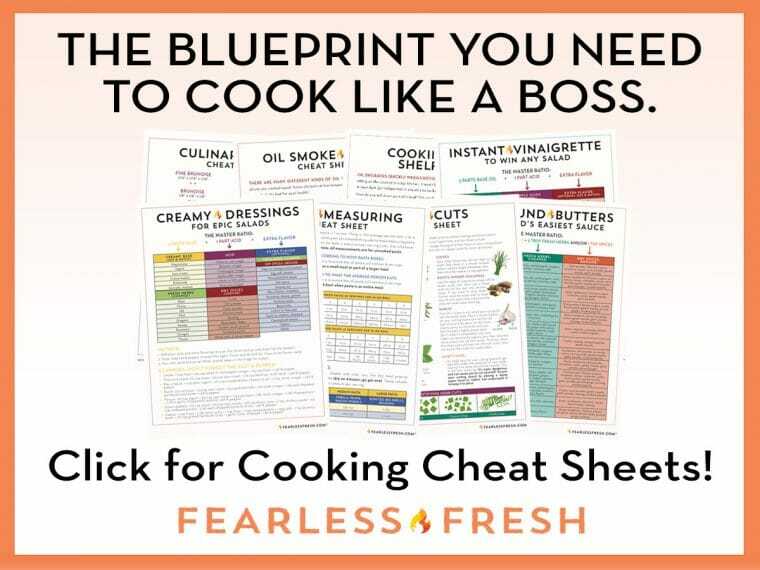 Fearless Fresh Cooking Cheat Sheets are easy mix-and-match cooking guides, designed to act as your “right here” cooking teacher by teaching you to cook with confidence and ease. 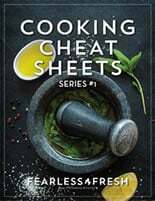 There are two sets of cheat sheets — the Cheat Sheets Series 1 set includes charts will guide you through making creamy salad dressings, chopping herbs and vegetables, making the world’s easiest sauce, and more. The Mega Measurement Guide is full of done-for-you kitchen math, so you’ll never have to convert measurements in your head again. Both are available in either physical laminated format or digital downloads. The printed versions are full-color hand-held guides, printed on thick 100# cardstock, and covered with 10ml lamination for maximum durability. Three-hole punching through the lamination allows you to store your cheat sheets in a binder, so they’re always at arm’s reach when you need them. The digital versions are in PDF format and compatible with any digital device. I’m officially launching the Cheat Sheets in November, but right now I’m offering a bundle of all cheat sheets sets for pre-sale at a discounted rate. If you order before October 20th, you will get the sale price and your cheat sheets will ship the first week of November. Want more details? Check out everything you need to know about Cooking Cheat Sheets here. Stephanie Stiavetti has a superpower, and it’s teaching people how to cook like a boss. After spending the past decade putting herself through culinary school and working in the food industry, she started Fearless Fresh to help you become the badass home chef you’re meant to be. Check out her cooking cheat sheets, which guide you through every step of the cooking process with creativity and ease. You can also find Steph on Instagram, Facebook, and Pinterest. I Have Type 2 Diabetes. And I’m Glad. If I cook and freeze the grains following your instructions, is there an optimal way to heat them up? Hey there! You have a couple of options: 1. You could just defrost them and then microwave them until warm. Or, 2. You could actually cook them a little less before freezing, which would allow you to drop them into boiling water for 1 minute to reheat while they finish that last bit of cooking. Hope this helps! Thank you very much for the tip!